Since 16 September, the drop in sea arrivals to Italy has entered its fifteenth month. Last August, less than 1,500 migrants have entered Italy irregularly by sea: the lowest number in a Summer month since 2012, the year before the “migration crisis” starterd. And while in September political instability in Libya spiked, departures from the country have remained low. The time has come to ask: to what extent is it in Italy’s interest to further tighten up its actions and policies aimed at discouraging irregular sea arrivals? It is time to focus on the opportunity-cost of what can be achieved through continued deterrence of search and rescue operations, and to reflect on how much political capital Italy is willing to spend on migration, and to do what. The answer should include a measure of the extent of loss in terms of human lives along the Central Mediterranean route, and which coincides with the further tightening on search and rescue (SAR) operations inaugurated by the new Italian government. Deterrence policies against search and rescue activity at sea are nothing new. Throughout 2017, we recorded an increase in controversies on the role played by SAR operations carried out by NGOs. NGOs have been accused by many of acting, whether intentionally or not, as a “pull factor”, i.e. that the fact that they operate near Libyan territorial waters encouraged departures. Despite how plausible this claim could appear, ISPI studies show that the reality is different: sea rescue operations carried out by NGOs did not have any significant effect on the levels of irregular migration flows from Libya. Instead, the big drop in departures from Libya and of arrivals to Italy can be linked to very precise events onshore in Libya, namely the decision by a series of Libyan militias that deal with / allowed irregular smuggling to start cooperating with Italy and the EU by stopping new departures. Furthermore, it is important to note that although the Gentiloni government had asked NGOs in the summer of 2017 to either sign a “code of conduct” or stop their SAR operations at sea, until May this year the Italian government had never openly and actively opposed search and rescue operations per se. From June 2018, after the Conte government took office, the strategy has changed. In addition to cooperating with actors that have a stake in the smuggling business in Libya, deterrence actions have been taken not only towards NGOs, but also against any entity operating SAR operations at sea along the Central Mediterranean route. This includes commercial vessels, Frontex ships and the Italian Coast Guard itself. The change in strategy by the Italian government, and the availability of data on irregular migration to Italy (collected by UNHCR, IOM, and elaborated by ISPI), allows for a more in-depth study on its potential consequences. The period of “Salvini policies”, i.e. the period following the inauguration of the Conte government: (1 June 2018 – 30 September 2018). This article looks at trends on irregular sea arrivals to Italy and the (estimated) number of migrants that have died or gone missing along the Central Mediterranean route in these three periods. In order to make them easily comparable despite different time frames, we generally rely on daily averages. It should be noted that this exercise considers as impossible to quantify the number of migrants trapped in Libya in horrible conditions, whether held in official or unofficial detention centres, or elsewhere. Migrants in Libya are nearly always detained for long periods and are subject to inhumane and degrading treatments or even torture. Irregular sea arrivals to Italy. In the twelve months preceding the drop in irregular sea arrivals to Italy, approximately 195,000 people disembarked in the country. The transition to Minniti policies coincided with a sharp drop in sea arrivals, which proved to be persistent. Daily averages show that, in the 12 months preceding the drop in sea arrivals, 532 migrants per day reached Italy irregularly (see fig.1). In the period that coincides with the implementation of Minniti policies, sea arrivals number fell by 78%, to 117 migrants per day. Finally, the period that coincides with Salvini policies was marked by a further decline in sea arrivals, to approximately 61 per day. This is equivalent to fall of 42% compared to the Minniti policies period, and of 89% compared with twelve months before the drop in sea arrivals. Dead or missing in the central Mediterranean. Studies that look into the number of dead and missing in the Mediterranean often emphasise the risk of death, by calculating the probability of losing one’s life during the crossing. 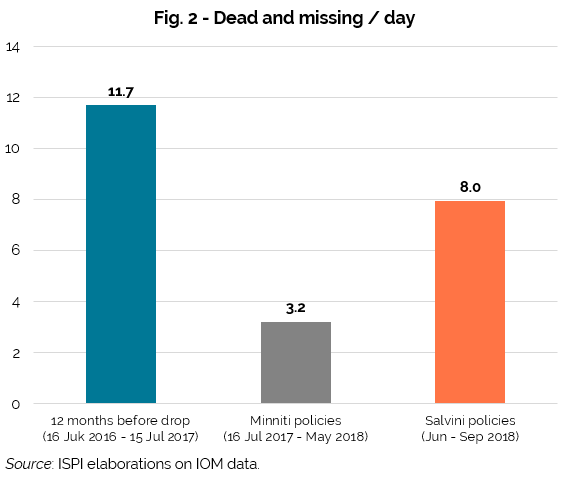 For example, in September 2018, 19% of those we know to have attempted to cross irregularly from Libya have died or gone missing – by far the highest rate ever recorded along the central Mediterranean route since sufficient accurate records exist. While the risk of death remains a crucial variable, it is not the most relevant: if only three people departed from the Libyan coasts in one month, and one resulted dead or missing, the calculated risk would be very high (33%) but its political relevance would be extremely low. Policy makers should instead be much more concerned with the (estimated) absolute number of people who die or go missing at sea over a certain period. Looking at trends in the absolute number of migrants dead and missing at sea per day, a very different trend emerges when compared to the constant decrease in sea arrivals to Italy. Before the drop in irregular sea arrivals, just short of 12 migrants per day have been estimated to have lost their lives at sea (see fig. 2). The period coinciding with the Minniti policies witnessed a steep decrease in the absolute number of dead and missing at sea, dropping to about 3 migrants per day. But, instead of a second drop, the four months of Salvini policies match a new surge in the number of dead or missing at sea, which climbed to 8 people per day. The trend follows a typical “V-shaped” curve: a drastic fall has been matched with a comparably drastic increase in dead and missing per day. In other words, the number of dead or missing per day recorded during the first 4 months of the current government would only go back to the low levels recorded in the Minniti period if no other migrant was estimated to have died or gone missing in the Central Mediterranean over the next 6 months. The opportunity-cost of deterrence policies. 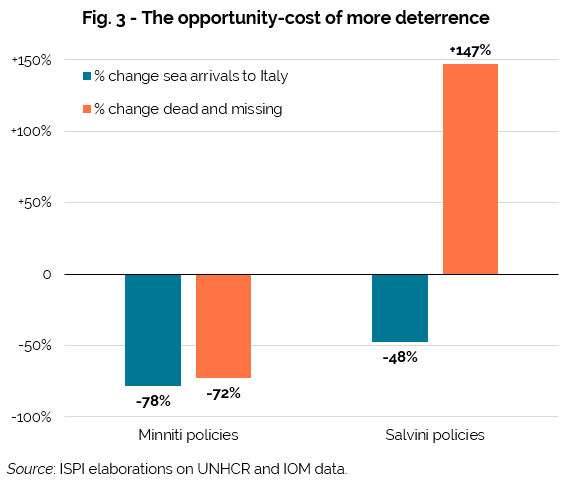 We can now compare the two periods of deterrence policies, moving from Minniti to Salvini. As shown in Fig. 3, these two periods show very different trends, in particular with regards to the number of dead or missing at sea. The period of Minniti policies coincided with a drop in migrants dead or missing at sea that was more or less in line with the drop in irregular sea arrivals to Italy. On the other hand, the period of Salvini policies was marked by a further decrease in sea arrivals (-48%), but also by a sharp increase in the number of dead or missing at sea (+147%, i.e. more than double the previous period). 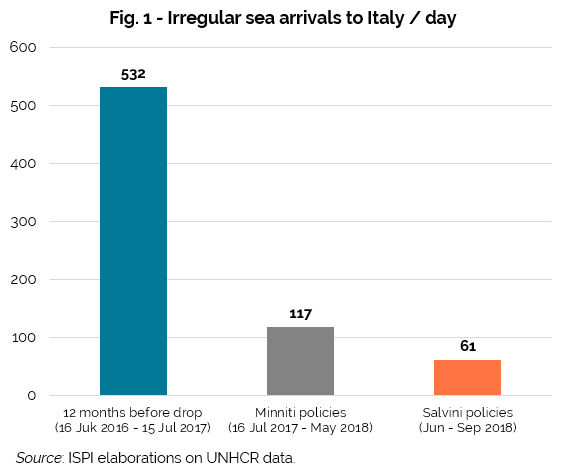 Since the drop in irregular sea arrivals to Italy had already largely taken place in the months preceding the inauguration of the Conte government, in absolute terms the “outcome” of Salvini policies regarding arrivals to Italy are modest. By projecting both policies over a one-year timeframe, Minniti policies would have led to a drop of approximately 150,000 arrivals, from 194,000 to 43,000. Salvini policies could not aim to achieve such a drop in the first place, as sea arrivals were already much lower: of course, arrivals in Italy can at most fall to zero. Bearing this in mind, sea arrivals in the first four months of the Conte government allow estimating approximately 15,000 sea arrivals over one year, i.e. a drop of about 28,000 arrivals. To conclude, Salvini policies of further deterrence at sea have coincided with a drop in arrivals of around 28,000 units, which is equivalent to less than 20% if compared to the drop of 150,000 arrivals recorded during the Minniti period. At the same time, Salvini policies coincided with a strong increase in the number of migrants dying or going missing at sea, which reversed the previous declining trend. When evaluating public policies, it is important to consider the opportunity-cost of each decision. Four months after the tightening on sea rescues, in the light of the numbers available, the usefulness of deterrence policies appears questionable to say the least, when a relatively modest reduction in sea arrivals in Italy, has coincided with a sharp increase in the number of dead or missing.